Hello everyone! It's safe to say it's been a while. I have been busy with numerous big changes these last few months, including moving house (I'm now back in England, goodbye Wales!) and falling pregnant - surprise! Barry M were still kind enough to keep me on their PR list during my absence, so I have some catching up to do. I'm beginning today with the return of the crackle polish. Read on for my swatch and more info. This silver crackle effect polish is a throwback to the crackle polishes released years ago. If you missed them the first time round, crackles are special effect topcoats that crack as they dry to reveal parts of your base colour. I find that they work best if you apply one quick, slightly thicker coat, and sit back and let it do it's work. Below is one coat over a bright green. What do you think? I could have used a more contrasting base colour to allow the crackle coat to pop more, but I also do like the more subtle look I ended up with. It also felt super springy to me! 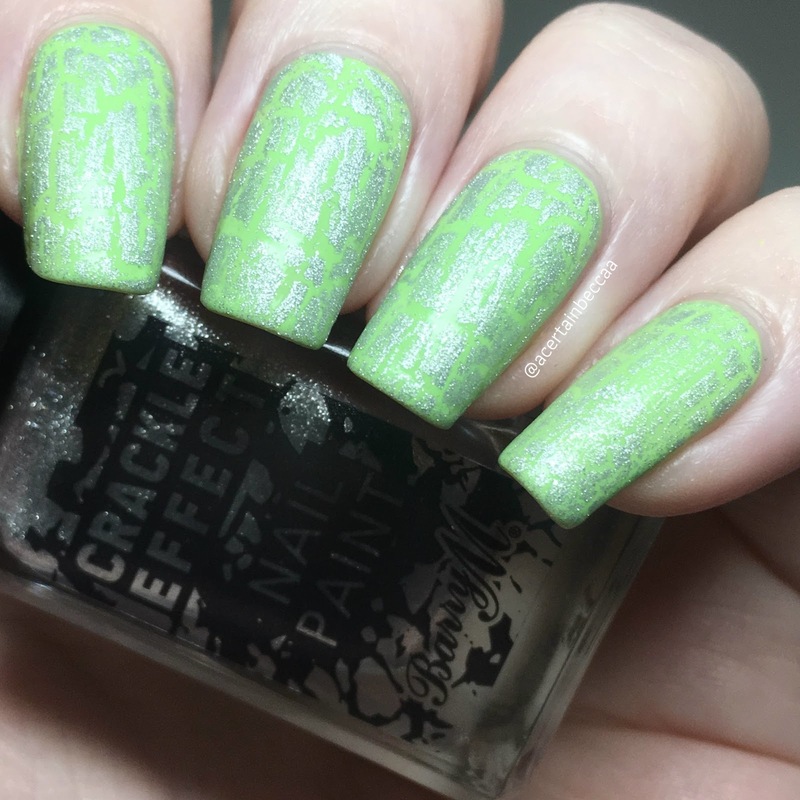 I definitely fell more in love with crackles after the initial hype had ended, so I'm glad they've made a slight comeback. You can find Barry M's silver crackle effect polish on their website here for £3.99. Before I end this post, I want to pop a quick thank you in here to anyone who's stuck around and still follows my nail accounts (as well as any returning followers or newcomers). I should back to a regular schedule now.